Yeah, Labor Day was a few weeks ago, but I still have to post this one! We went to the beach twice. Eric had the Friday before off, so we decided to beat the Labor Day crowd and head down to the beach at the Santa Cruz boardwalk. 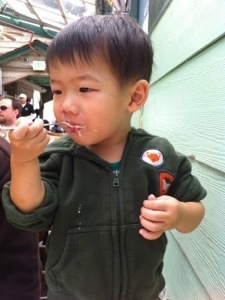 The last time we were there was almost a year ago and EJ was still in his stroller. He wasn’t walking yet. 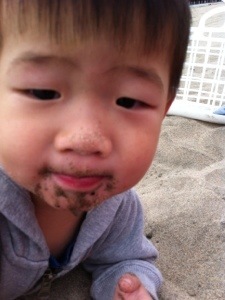 This time, EJ was walking around the beach by himself, while we laid lazily on the beach. Hehe, of course all the time keeping a keen eye on him. We went a little early, so the skies were still overcast and it was a little chilly. EJ brought his sand toys. 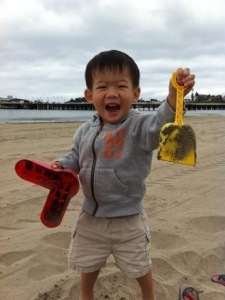 The first time these toys were to see real sand at the beach! 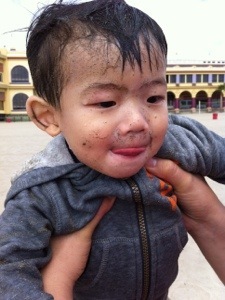 EJ had fun digging in the sand. 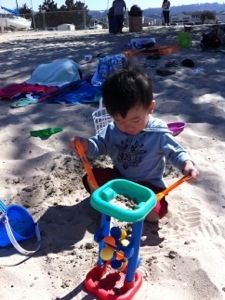 And when Eric tried building sandcastles, EJ had fun knocking them over! 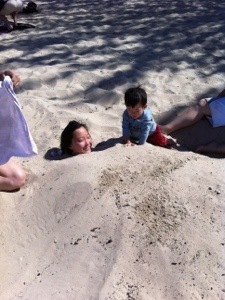 For some reason, maybe true for all boys, EJ decided he wanted to try what sand tastes like. So, he did. Couldn’t stop him. We went closer to the water and I taught EJ how to run in when the waves came in. It was so adorable hearing him squeal in excitement as the waves were trying to get him. A little while later, he decided that he would let the waves get him. So he got completely soaked. Drenched! It was cold, so we packed up and dried off after that and headed to the boardwalk. 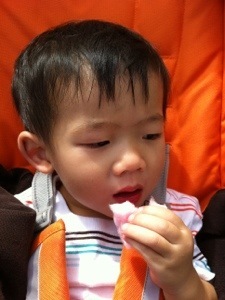 On the boardwalk, EJ had his first taste of cotton candy. I much preferred it when we used to eat it on a stick. Now it’s all pre-made and pre-packed. Ah well. 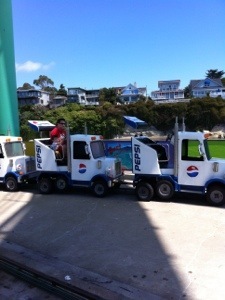 It was also EJ’s first time on these rides! He went a few times on the same ones. He wasn’t tall enough to go alone, so the choices were limited anyway. 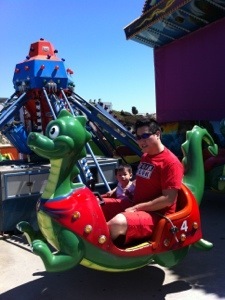 EJ had fun going on them many times, but Eric had enough. He was getting dizzy. Haha. Anyway, that was part 1 of our Labor Day weekend. 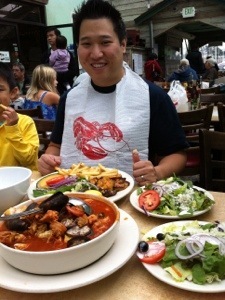 On Monday, our neighbors were going to Moss Landing for Phil’s famous Cioppino. So, of course we had to tag along. There were four families in total. Luckily we went early and beat the crowd. It was as good as I remembered. Well worth the drive. I think we come here about once a year. After lunch at Phil’s, we headed to the beach again! It wasn’t as chilly as Friday, but the water was cold! 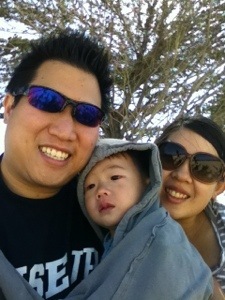 We went to the Municipal beach in Monterey. This time EJ went straight for the water. But we only played for a little while in the water cos it was freezing! We quickly dried off and he was content playing in the sand.